"Canadian cities are progressive, confident, and natural homes for forward-thinking global leaders." Prime Minister Justin Trudeau is swarmed by employees at the Amazon Fulfillment Centre in Brampton, Ont., after making an announcement, Thursday, Oct. 20, 2016. Trudeau has written a letter to Amazon extolling the virtues of Canadian cities as the company seeks a location for its second headquarters. TORONTO — As Canadian cities compete with each other — and dozens of jurisdictions south of the border — for Amazon's new $50-billion headquarters, Prime Minister Justin Trudeau has pitched Canada to the company's founder. In a letter addressed to Amazon CEO Jeff Bezos, Trudeau makes a general case why any prospective Canadian suitors could prove attractive as the retail behemoth's next corporate home. Trudeau's letter, which starts with "Dear Jeff," does not single out any of the bidding cities, which include major centres like Toronto, Vancouver and Ottawa alongside acknowledged longshots like Halifax and Sault Ste. Marie, Ont. Instead, Trudeau outlines commercial, cultural and social reasons why Amazon should call Canada home to its new headquarters — dubbed HQ2 — and the 50,000 jobs expected to come with it. "Canadian cities are progressive, confident, and natural homes for forward-thinking global leaders," Trudeau's letter reads. "They are consistently ranked as the best places to live, work and play in the world." 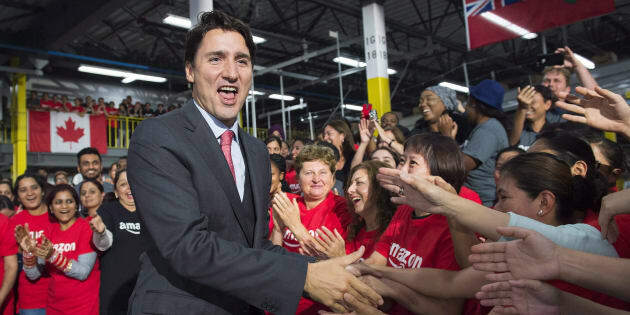 Canada's business advantages include costs among the lowest in the G7, universal health care that lowers the cost to employers, stable banking systems, and a deep pool of highly educated prospective workers from both at home and abroad, according to Trudeau. The letter also touches on increased government investment in skills development, culturally diverse, walkable cities and streamlined immigration processes — an apparent dig at U.S. President Donald Trump's anti-immigration policies. At least one major bidder seized on that contrast as part of its formal proposal. "We build doors, not walls," reads the cover letter from the group co-ordinating the bid from Toronto and several surrounding municipalities. "Those doors open to highly skilled economic immigrants and international students who can easily become permanent residents and citizens." Toronto touts its diversity as one of its strengths alongside its lower business costs relative to similarly sized American competitors, expanding infrastructure and low crime rates. The city said it also ticks several of the boxes Amazon laid out when it solicited bids from North American cities last month. The company said it wants to be near a metropolitan area with more than a million people; be able to attract top technical talent; be within 45 minutes of an international airport; have direct access to mass transit; and be able to expand that headquarters to more than 740,000 square metres in the next decade. Calgary, which can make many of the same claims, opted for a more irreverent tone in its approach to the company. Calgary Economic Development said city spokespeople flew to Seattle — where Amazon's current headquarters is located — to erect a 36.5-metre-by-three-meter banner declaring "We're not saying we'd fight a bear for you ... but we totally would. " The bid also included messages chalked onto local sidewalks, the city said. Examples included "Hey Amazon. We'd change our name for you. Calmazom? Amagary? Love, Calgary ;)"
Calgary Economic Development did not reveal details of what its bid actually contained, but said it presented a strong case. "Calgary offers Amazon a unique value proposition for HQ2 with top quality human resources, turnkey real estate solutions, a low cost of doing business, and an exceptional quality of life," it said in a statement. "As our sales pitch suggests, we will do more to help Amazon than any other city." Halifax, too, was tight-lipped about the particulars of its bid, but said quality of life was a key focus. "If Amazon wants to give employees a city that they can fall in love with, I think Halifax is that city," Mayor Mike Savage said Thursday. "If it comes down to ... the inducements that a province or a city can offer, financial only, then we're most likely not a player. But if it comes down to a bigger picture, which includes a number of things, then I think Halifax has a very competitive case to make." One other dark horse candidate submitted a proposal that captured two of the trends common to several Canadian bidders. The northeastern Ontario city of Sault Ste. Marie is an unlikely suitor for the corporate giant, said city councillor Matt Shoemaker, who oversaw the city's bid. But by teaming up with sister city Sault Ste. Marie, Mich., located mere kilometres across the Canada-U.S. border, he said the smaller community has much to offer. He said the two cities can compete in terms of infrastructure, expansion room and transport options, but said the real draw lies in its scenic location and access to the great outdoors. "You could canoe to work. You could kayak to work," he said. "You could have recreational activities on the weekend that you would have to go to in a big city. Here, in Sault Ste. Marie, they're at your doorstep." People eat lunch in a courtyard outside of the Amazon.com Inc. headquarters in the South Lake Union neighborhood of Seattle, Wash., Wed. June 15, 2016. Cities all over North America are bidding to be the site of Amazon's second headquarters. The city is not alone in submitting a joint pitch with a neighbouring community. Windsor, Ont., has crafted a proposal with nearby Detroit, Mich., which mayor Drew Dilkens described as offering Amazon the best of both worlds. He said the company would have maximum flexibility to take advantage of taxation and talent advantages on both sides of the border, adding the cities could make it particularly easy for would-be employees to commute. "If there were campuses on both sides of the waterfront, we could physically connect it with a cable car," he said. "That's the unique part of this proposal is... giving Amazon the flexibility to scale where they think it works best for them." The cities of Ottawa and Gatineau, Que., have opted for a similar joint approach in their bid. Blair Patacairk, managing director of investment and trade with Invest Ottawa, said the bid hinges on the strong cluster of universities and colleges in the area as well as its evolving technology sector and capacity to meet Amazon's logistical needs. But even if the bid does not succeed, he said the process of compiling the pitch has laid groundwork for the future. "We would love to win Amazon," he said. "But if that didn't come to pass, then we would look at the good best practices that came out of this...and put our best foot forward internationally on attracting business to Canada's capital region." Other Canadian centres bidding for HQ2 are Edmonton, Winnipeg, Montreal and Hamilton.